The DVF Gold Tonda Box Clutch is a lambskin leather box clutch made from gold effect embossed leather, with a silver frame and gold and black enamel snap clasp. The bag has a removable silver chain strap for alternate carry options. Inside, the bag has a black lining and there is an internal slip pocket with a DVF brand plaque. Measurements: 21cm / 8.2″ x 9cm / 3.6″ x 6cm /5.6″ (all measurements are approximate). 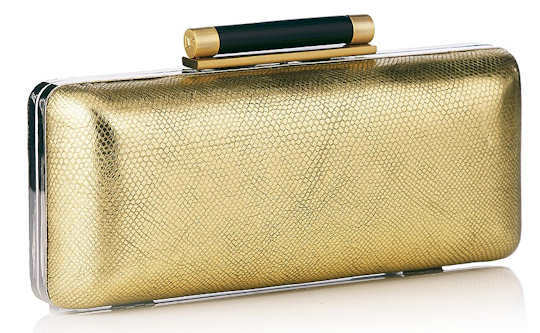 Style Note: This clutch is a great way of adding a finishing touch to an evening outfit, whilst at the same time nodding to the current metallics trend. The clutch has a shapely outlet and luxurious fine detailing making it a striking accessory which will definitely make a statement with a little black dress and vertiginous heels.